Like with many aspects of caregiving, managing important duties on a routine schedule can help provide structure and reliability to yours and your loved one’s week. This means taking regular baths on the same days each week, roughly around the same time, i.e. every Tuesday and Friday evening after dinner. As older adults age, they don’t necessarily need to bathe as frequently as they once did. This is in part because they are less active and therefore don’t sweat as much but also because bathing can be a laborious endeavor and the stress and exhaustion of it may outweigh the need to take one. A routine bathing schedule also helps you stay on track and gives your loved one a fixed time peg that may help them remember and prepare for each bath-time accordingly. Bathing is inherently fall-prone, even when you have a caregiver assisting you. Mobility, coordination, and vision problems can all inhibit a person’s ability to safely enter and exit a shower/tub area and the addition of water on the ground only complicates things. As a caregiver, you can also increase your risk for injury (like pulling a back muscle) if you attempt to help your loved one take a shower all on your own. 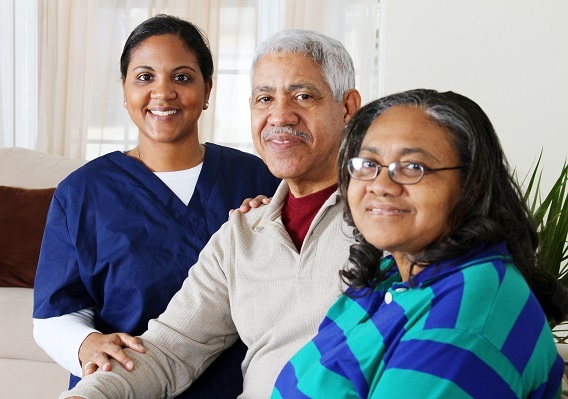 If you are unable to ask another family member or someone your loved one is comfortable with for help, consider contracting home care services to provide an aide who can assist you. Typically, if someone’s condition is severe enough that it robs them of their ability to maintain their own hygiene, you can talk to their doctor about writing an order for home health services that can help with tasks like bathing. If your loved one is in no position to get in the tub or shower, a simple sponge bath in their bed may be in order. You can utilize perineal sprays and foaming soaps that don’t require you to rinse them off as well as dry shampoos that can help freshen hair without the use of water. Ask your loved one’s doctor or home care agency for sponge bath products they recommend or look online or at your local pharmacy. Be respectful, gentle, and crystal clear about what you are going to do, i.e. “I’m going to help you sit down now and turn on the water. Now we’re going to wash you off with this soap and washcloth,” and so forth. Play soft music your loved one enjoys that may help relax and distract them. Give them something to hold onto like a washcloth or a bath toy. Place a towel over their shoulders, chest, or lap when you’re not washing those areas to help them feel less exposed. When your loved one is all fresh and clean, make sure to dry their whole body before they get dressed by gently patting them with a towel; this helps to prevent bacteria, fungi and yeast buildup that can lead to rashes and skin infections. Watch Pam Goodfriend's interview about stress and caregiver burnout. Combatting Caregiver Burnout - There is relief!